A new report on smartphone buying plans provides excellent news for Apple, so-so news for Android-handset manufacturers, and downright lousy news for RIM. Piper Jaffray analyst Gene Munster's annual smartphone purchasing survey – which was conducted by querying 400 people in Minnesota, New York, and California, and in China and Korea – discovered that 65 per cent of them say that their next phone will be an iPhone. Just 19 per cent said that they plan to buy an Android-based phone, and a mere 2.5 per cent said that their next phone was going to be from RIM. Admittedly, the survey's sample size is small, so the numbers should not be taken as gospel, but the vast range between 65 per cent and 2.5 per cent can't come as good news to the folks sweating in their corner offices in the aptly named Waterloo, Ontario, RIM's home town. More interesting than those raw plan-to-buy numbers, however, are the survey's plan-to-switch numbers. Although 52 per cent of those surveyed currently own an iPhone, even more – the aforementioned 65 per cent – plan to be iPhone owners in the future. The trend for Android is going in the opposite direction. Although 26 per cent of the respondents now own an Android-based smartphone, only 19 per cent plan to buy such a phone for their next purchase. For RIM the numbers are grim: 6.5 per cent of the respondents said they currently own a BlackBerry, but only 2.5 per cent plan to pick a BlackBerry when they next go shopping for a smartphone. Among those who already own Android phones, a total of 60 per cent plan to buy another Android-based phone, which is an improvement from the 47 per cent re-buy rate in last year's survey. That's all well and good, but as Munster told CNN Money, "Android is still losing 33 per cent of current users to the iPhone." In further bad news for RIM, he reported that "We also note that 38 per cent of Blackberry users expect to switch to iPhone." There's one last nugget of info from the survey that bears repeating, one that flies in the face of smartphone design trends. The survey respondents were shown to-scale drawings of the current iPhone with its 3.5-inch display and a Motorola Droid Razr Maxx, which has a 4.3-inch display. 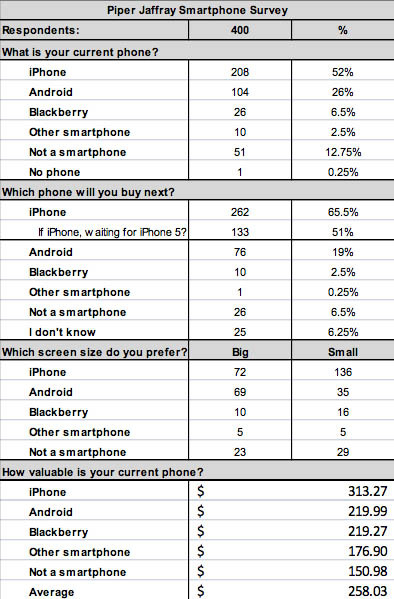 No matter which phone they owned – iPhone, Android, or BlackBerry – all repondents preferred the smaller display. Apple is reportedly including a larger display on its upcoming iPhone 5 (or wherever it ends up being called), but how well that phone performs in the marketplace will likely not settle the small-versus-large display question. According to Munster, Apple is poised to bag over half of the 170 million smartphone sales he projects for next year.